During my junior year of college in 2007, I returned to DC from Oberlin where I interned with the office of then-Mayor Adrian Fenty. Rotating between various executive offices, I learned about and became interested in DC’s language access program through the Office on Latino Affairs. After graduation in 2008, I continued working with OLA’s language access department, gaining skills and competencies in compliance monitoring, testing methodologies and Title XI of the Civil Rights Act. 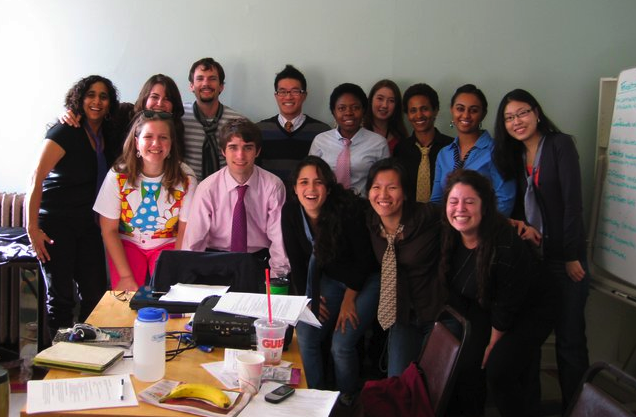 In 2010 I was brought on to work for the DC Language Access Coalition, a group of 40+ community organizations advocating for equal access to government services for LEP/NEP residents and workers in the District. I served as Housing Program Coordinator and chaired the Housing Committee in a policy advocacy role (staff photo from 2011 below). As a graduate student I completed an intensive internship with the Equal Rights Center (ERC), where I learned more about designing testing methodology to determine the presence of violations of Title VIII of the Civil Rights Act of 1968 (Fair Housing Act) in housing. I also worked with the Immigrant Rights Program at the ERC and Washington Lawyers Committee for Civil Rights and Urban Affairs to provide support in cases of national origin and deaf/blind discrimination. After graduation, I hope to return to the world of advocacy in a research, communication(s), or programmatic capacity where I can apply my skills as an anthropologist and linguist for positive social change. For more information, please refer to my resume here and thanks for browsing!